I’m a sucker for tiny bars and cafes. Especially if they have this ‘living room’ feel to them. Another place in Vasastan that stands out, but is still remote; Erlands: It’s almost like stepping back in time into to the ’60s and ’70s. 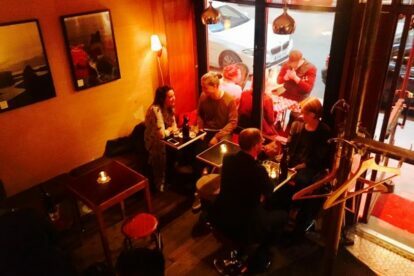 Besides having live jazz music every Saturday from 15:00, they serve classy cocktails, quality wines, somewhat good beers and food on the side as well. Even though the more ‘special’ drinks, like the wines, are a little bit pricey, I think the experience is totally worth it. Coming in their upstairs seating area, it’s almost like being over at a friend’s about 5 decades ago. The candles, the furniture and the service even, bring the vibe to a decadent but very relaxed pace. The bartenders have great knowledge about their servings and know what to offer if you have any special requests. I think they are living their jobs by the nostalgia and the philosophy of this place, you really can tell!